"The Haunted House" by Italian graphic artist Daniele Montella. As the haunted holiday approaches and our thoughts turn to creepy wonders, things that go bump in the night and pillow cases full of candy corn harvested by the kids, one might be startled to know that a real scary celebrity resides in our midst, hidden in plain sight in Eureka on a hill overlooking Humboldt Bay, except when enshrouded by the fogs that plague our little Victorian seaport. The Carson Mansion, one of the most photographed Victorian homes, is known for its unsurpassed redwood woodwork and extraordinary architecture, but few realize it has served as a template for haunted house art throughout the world, inspiring website design, video animations, posters, paintings, book covers and even amusement parks. 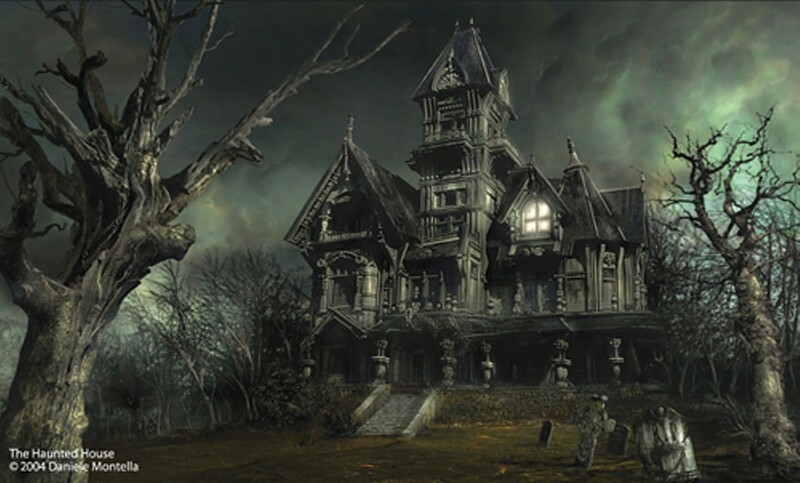 Do a Google image search for the phrase "haunted house," for example, and repeated among the top results is an eerie creation by Daniele Montella, one of Italy's top graphic artists. This image in particular, created in 2004, has gained a life of its own on the Internet, having been used for everything from website home pages to haunted house posters to news articles. “Each year, during Halloween, I get requests for use of the image, even from sites of paranormal research, or even by groups claiming to be ghostbusters,” Montella said in an email interview. Thanks to Montella’s digital expertise, the house is a jumble of horrors: its decaying exterior is flanked by gnarly trees and crumbling tombstones. But the menacing nighttime shadows cannot hide one simple fact: The building is essentially the Carson Mansion. “I think the Carson Mansion is by definition a haunted house. It is a wooden house, with a structure shaped like a castle, complete with a tower, patio, all of which lend themselves to the theme of the haunted house,” he said. Other digital artists have fallen under the spell of the Carson. 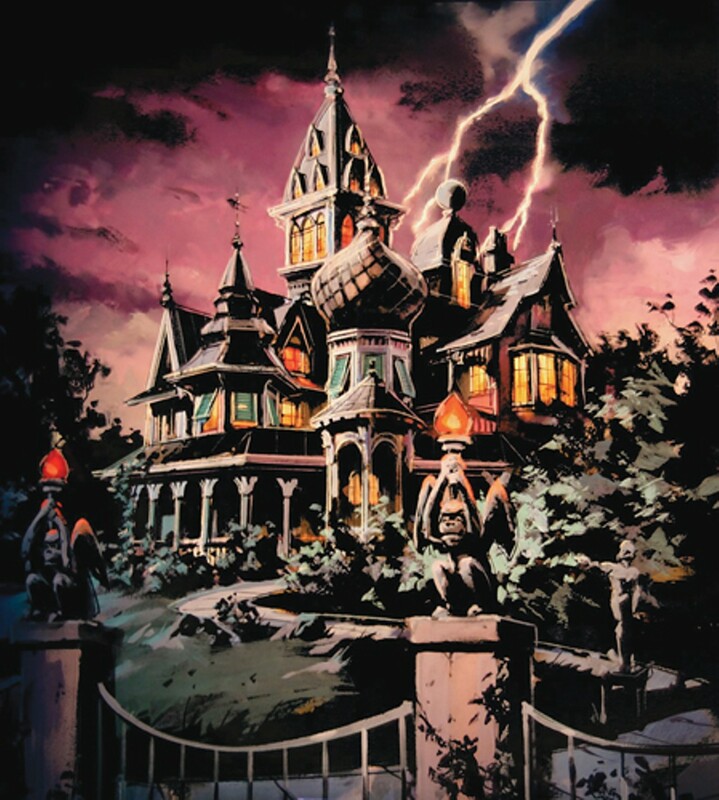 Arlen Nielson, a graphic artist from Vancouver, Canada, used it as the basis of a popular computer desktop background image with a haunted house theme. Daniel Norbury, a 3D animator from Nottingham, England, selected the Carson house as the location of a murder mystery for a video game demo. Bryan Camilleri, a spray paint artist living on Gozo, an island near Malta in the Mediterranean, is selling Haunted Mansion paintings, with the historic Eureka house as the unmistakable subject. How did the Carson Mansion travel to such distant canvases and computer screens? There are several reasons. First, there are countless images of it that can be easily accessed on the Internet. 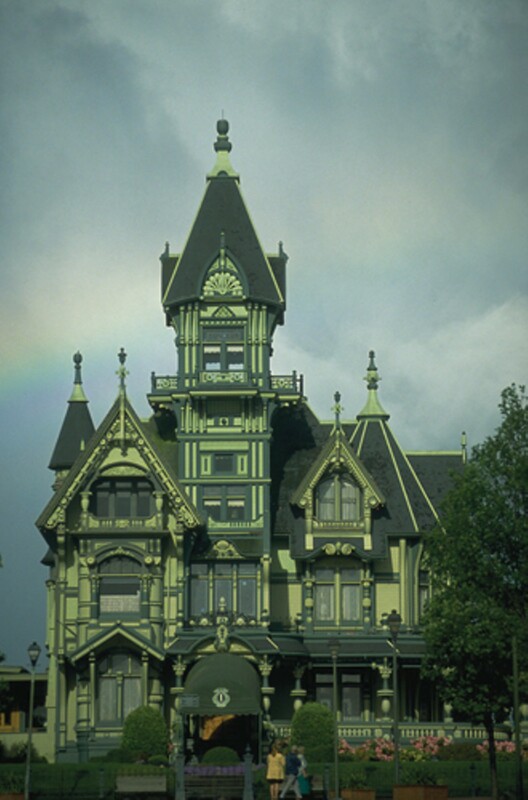 "It's well known that the Carson Mansion is the most photographed Victorian in the United States," says Ray Hillman, Eureka's premier historic tour guide. "Its images have been broadcast through the media, so that it can easily be an inspiration for those looking for something to make a haunted house image." Norbury confirms that assessment. "I looked at various existing spooky looking houses and found the Carson Mansion, which had many different photographs taken of it at different angles," which was essential to making an animation. Many such images find their way to stock photo websites, which graphic artists frequent. 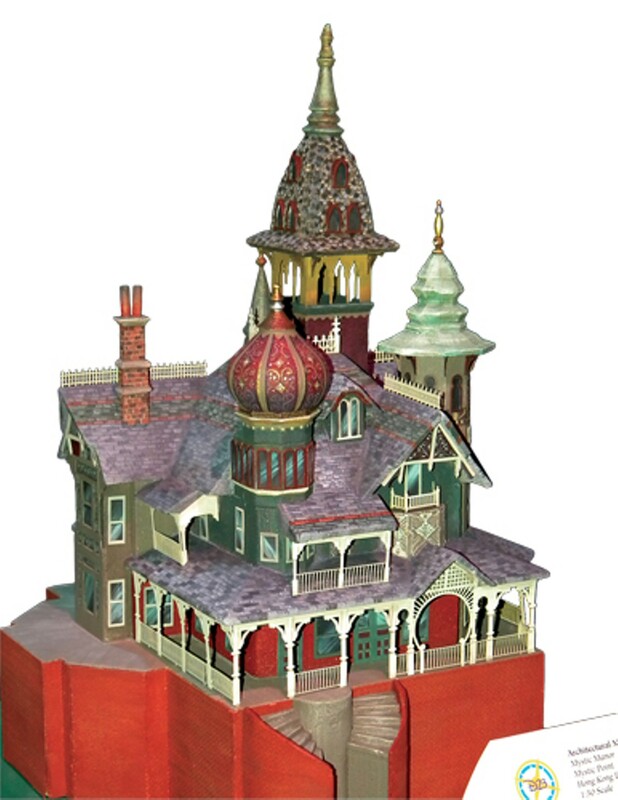 Nielsen said he found a Carson Mansion image from one such Internet stockpile. Indeed, there are plenty. Go to fotosearch.com or worldofstock.com, for example. 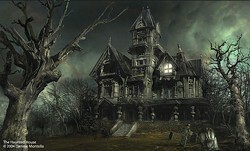 Type in "haunted house." One soon finds oneself at the virtual corner of Second and M streets in Old Town. Second, the house is such a Victorian oddity that it lends itself to imaginative fancies, including scary ones. "I don't think the Newsoms [the architects who designed the house] realized what it was going to be until it was built. They threw everything at it, including the kitchen sink," said Jill Macdonald, a Eureka historic architecture expert. Despite its riot of styles and features, there is one structure on the house crucial to its elevated status in the realm of eerie abodes -- its imposing 100-foot-high tower, which rules the landscape on the east side of the Eureka waterfront. "The Victorian flamboyance of grand central tower is rather dominating, just by its sheer mass," Hillman said. Macdonald agreed. "The top cupola is very Alfred Hitchcock-looking. It's a defining characteristic of the house." Speaking of the great suspense filmmaker, Hitchcock is associated, albeit tangentially, with the Carson Mansion's scary legacy, revealing that it predates the Internet by decades. In 1961, Random House published "Alfred Hitchcock's Haunted Houseful: Nine Cool Stories About Haunted Houses and Ghosts for Boys and Girls." 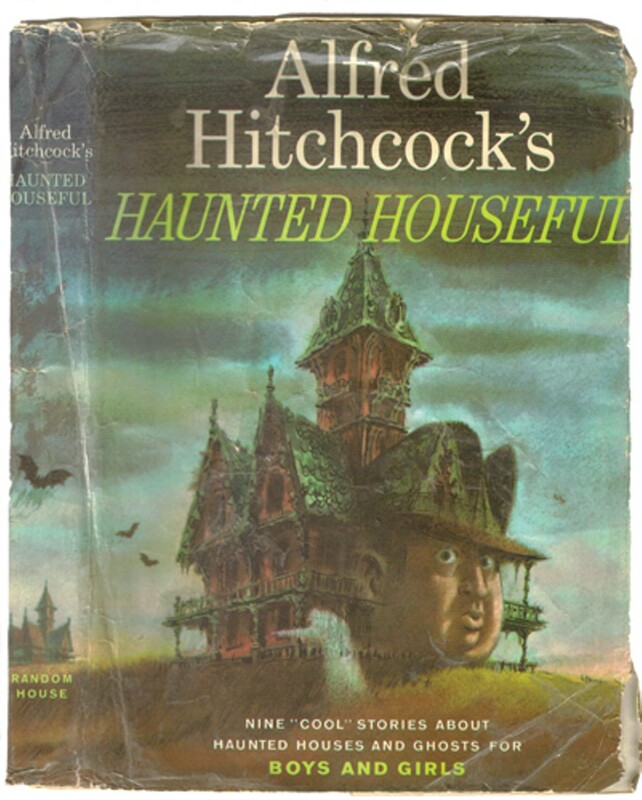 The book cover, illustrated by the late Fred Banbury, sports the looming face of Alfred Hitchcock alongside a cartoon-ized Victorian home. The inspiration is clear to Hillman. "Oh, the Carson Mansion is there," he said. "They've increased the size of one of the gables, but look at the sunburst panel at the cap of the tower, and that lunette [half circle feature] on the tower. Whoever drew that book cover definitely had images of our mansion." Steeped in California history, Hillman recalls other ways in which the Carson Mansion has influenced fantastical architecture in the Golden State. At Disneyland in Anaheim, for example, the train station tower was inspired by the Carson Mansion cupola, he said. The former has circular clocks in the place of the semi-circular lunettes. Otherwise, they look strikingly similar. "The architect that built the train station visited the Carson Mansion before construction of Disneyland," Hillman said. The Carson Mansion has impressed imaginative creators in the past and present. What about the future? Well, speaking of Disneyland, another Mickey Mouse theme park is slated to open a major attraction in 2013, inspired by, according to many ... you guessed it. Last year at the Disney Fan Club Expo in Anaheim, Disneyland Hong Kong created a buzz among amusement park enthusiasts when it unveiled sketches for Mystic Point. The main attraction will whisk visitors back to the year 1908, into a Victorian home on a remote hilltop known as Mystic Manor. A mischievous monkey opens an enchanted music box and all sorts of shadowy shenanigans ensue. MiceChat.com, the leading Internet clearinghouse for news related to Disney theme parks, came alive with posts on its forum. A leading question: What inspired the design for the Mystic Manor exterior, a mostly Victorian horror with a strangely added onion dome? A handful of candidates were forwarded, such as Morey Mansion in Redlands, Calif., which has such a feature. But overall, most agreed that the primary muse was the green, many-gabled wonder built for the family of William and Sarah Carson in 1885. "It struck me that the Carson Mansion in Eureka, which I suggested would be a great building to house an attraction, looks a lot like Mystic Manor," one MiceChat.com member named CaliforniaAdventurer said. Hillman agreed. "Look at the porch, the spacing of the columns, the general configuration, I'd say no doubt. And the tower, they just doodled with it a little." Certainly visual artists can transform the Carson Mansion into super-scary houses, but the question remains whether the house is inherently creepy or whether said creepiness needs to be brought about through creative manipulation. "I may be too close to it, but I don't think it's scary," said Macdonald, who has studied the building extensively and regularly visits the house, which since 1950 has been owned and operated by the Ingomar Club, a private civic group. There may be paranormal rumors, Macdonald said, but they are whimsical and fun, not frightening. Hillman agrees, to a point. "In the daytime, it has an uplifting look, a fanciful look," he said. "But at night, when the shadows are deep, and our thoughts are more in the dark world, you can start spinning tales."